(16/P89) TRENTON –Outdoor enthusiasts and fans of all things arboreal will gather again on October 1 at the Department of Environmental Protection’s Forest Resource Education Center in Jackson for the 22nd Annual Fall Forestry Festival. The festival will be held from 10 a.m. to 3 p.m., rain or shine. Admission and parking are free. Visitors will get the chance to meet Smokey Bear, take a hayride, visit the New Jersey Tree Nursery, or join one of the many guided hikes scheduled throughout the day. Professionals in the natural resource field will also be on hand to give tips on water and soil conservation, composting, beekeeping, invasive insects and diseases, maple sugaring, managing your backyard forest, and more. Acorn planting, as well as pumpkin painting and birdhouse building are just a few of the hands-on experiences for children, teens, and parents to enjoy. Plans are in place for demonstrations of the center’s sawmill and the utilization of logs from storm and/or insect damaged trees from around the state to be milled into lumber. In 1994, the Department of Environmental Protection’s Forest Resource Education Center in Jackson hosted the first Fall Forestry Festival, drawing attention to the work the center does in educating the public about forest stewardship — managing New Jersey's forest resources so that we have healthy trees and forests, clean air and water, and places to learn about and enjoy the outdoors. Food and beverage will be available for purchase at the Festival. Sturdy hiking shoes and insect repellant are encouraged. The Forest Resource Education Center is located at 495 Don Connor Blvd in Jackson. For driving directions to the Forestry Festival, call the Forest Resource Education Center (FREC) at 732-928-2360 or visit www.forestrycenter.nj.gov. 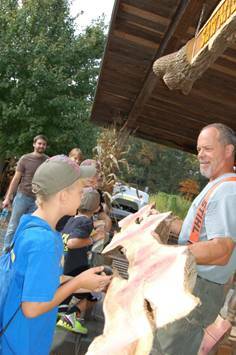 The Forest Resource Education Center (FREC), operated by the DEP's State Forestry Services, is committed to providing exceptional conservation education programs that promote benefits of trees and forest stewardship to all age groups at no cost. It is the sole public facility in NJ focused on forestry education. Located on nearly 900 acres, the FREC also offers miles of trails for hiking, biking and nature watching. The Toms River, which runs through the FREC, is regularly stocked with trout to provide an exciting fishing experience for anglers. For more information, please visit the FREC’s website at: www.state.nj.us/dep/parksandforests/forest/njfs_frep.html. The New Jersey Forest Tree Nursery, co-located on the same property, grows 300,000 seedlings yearly for reforestation efforts across the state. The Nursery has grown and distributed more than 220,000 tree seedlings for the Tree Recovery Program, providing them to New Jersey residents to replace trees lost in Superstorm Sandy. It also provides trees and seedlings for Arbor Day events and also boasts seedlings that flew in space on the Shuttle Columbia in 1997.